The UN's Central Emergency Response Fund (CERF) allocated $20 million on Wednesday to ensure aid reaches those most affected. "The CERF funds will complement the three Governments' immediate efforts to provide life-saving and life-sustaining assistance to affected communities, including in health, food security, protection, nutrition and education," said UN humanitarian chief Mark Lowcock. "Vulnerable groups such as children, women who are pregnant or breastfeeding, people with disabilities, and those affected by chronic illnesses will be prioritized". Mr. Lowcock explained that CERF funding was just the beginning, and much more will be needed, especially in terms of food assistance in the short- and medium-term as the flooding occurred in the middle of the crop-growing season. Much of the livestock is believed to have perished in the flooding, in areas that were already facing 'food-crisis' levels of food insecurity. The warehouse of the UN's World Food Programme (WFP) in Beira was badly damaged by Idai, but some food stores remain intact and is being distributed to displaced people in the city and in Dondo, higher north. Twenty tons of high-energy biscuits have been airlifted in, to be distributed by helicopter in cut-off regions. WFP is also funding drones to support Mozambique's disaster management agency, the INGC, with emergency mapping. 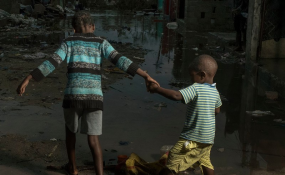 To enable the humanitarian workers to operate, an emergency wi-fi connection was set up in Beira by the UN. "The situation is very bad. The damage is quite serious," said the head of the UN's migration agency (IOM) in Mozambique, Katharina Schnoering. "It Is very difficult to get a clear overview of what is going on. There are many communications issues, there's no power in Beira. There is no road access because the Buzi River came up and washed out the road." In Malawi, the representative of the UN Children's Fund (UNICEF), Johannes Wedenig, said emergency supplies have started arriving in the country but that many were already "pre-positioned in areas of Malawi that are regularly affected by natural disasters", allowing the UN to move quickly to meet people's immediate needs, in particular in terms of water and sanitation, medicine, insecticide-treated bed nets, and schools supplies for the establishment of temporary classrooms.